Israeli electric vehicle company Better Place turned a corner this week when its first electric cars, which are soon to come to Europe, hit the roads of Tel Aviv in Israel. The firm, which was set up four years ago by entrepreneur and ex-SAP Director Shai Agassi, aims to lease the batteries for electric vehicles (EV) and also provide the infrastructure at which they can be recharged and swapped. The company has developed a battery “swap-station”, which automatically swaps depleted batteries for full ones in the same time it takes to fill a car with petrol. The company is in partnership with Renault to install the electric car charging infrastructure in Israel, Denmark and Australia. According to reports, drivers will start using the better place network in Denmark next month. 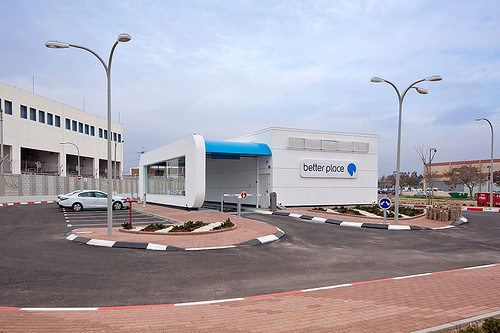 If you are curious to see Better Place’s cars in action, Israel National News, A rutz 7, has a comprehensive report in English. For all the concerns about range anxiety, technical challenges and financial barriers, it can only be seen as positive that Better Place’s plans are coming to fruition. EVs are undoubtedly a good choice for people who want to use a low carbon vehicle in an urban environment. They are also a great solution for vehicle fleets like delivery vans, which operate in a “return-to-base” environment. However, EVs are not currently suitable for every type of journey, and there is some debate over whether an electric charging infrastructure is viable or even practical. This is confirmed by the European Expert Group on alternative transport fuels, Hyer. The Group’s most recent report identifies the many different projects around Europe. For example this week the UK government backed hydrogen as a future fuel with a new development programme called UKH2Mobility. Hyer is calling for transitions to alternative fuels to be co-ordinated at the EU level. When does it always rain on me?